Stephanie Dosenâ€™s Tiny Owl Knits, has quickly gained iconic status among knitters: her patterns are brisk sellouts (at $5.50 per pattern) online, and she has been given feature coverage in both mainstream and knitting magazines, including Bust, Handmade Living, Simply Knitting, and Yarn Forward. Today's avid, busy knitters love small patterns that knit up in a day or a weekendâ€”and Stephanie Dosenâ€™s clever knits fill the bill. 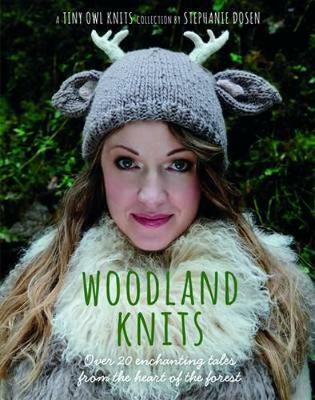 Right now, knitters also love animal-themed knits, and they canâ€™t seem to get enough of Stephanieâ€™s delicately beautiful patterns that incorporate deer, fox, owl, and other woodland themes (plus pretty flowers and vines) and look like nothing else on the market. Here are 20 cute, contemporary projects to knitâ€”including all the quick-to-make favoritesâ€”hats, scarves, wristlets, bags, wraps, and mitts. Traditional, straightforward stitches combine with wonderful yarns and clever patterns to produce accessories with an expensive boutique look.